England's Rajiv Ouseph is through to the semi-finals of the European Championships in Kazan, Russia. 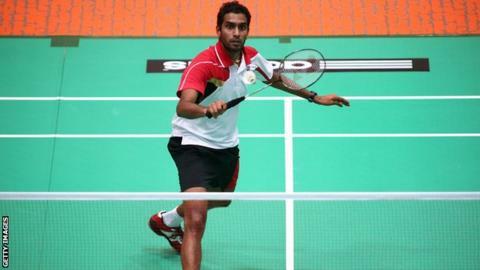 Fifth seed Ouseph defeated third seed Hans-Kristian Vittinghus of Denmark 15-21 21-15 21-11 and will meet Russian Vladimir Ivanov in the last four. However, Scottish mixed doubles pair Robert Blair and Imogen Bankier were beaten in their quarter-final. The fourth seeds lost 21-14 21-18 to Danish duo Mads Pieler Kolding and Kamilla Rytter Juhl. England's men's doubles pair of Chris Adcock and Andrew Ellis reached the semi-finals with a 19-21 21-17 21-8 win over Russians Nikita Khakimov and Vasily Kuznetsov, while Bankier reached the last four of the women's doubles with her Belarussian partner Petya Nedelcheva.